June 2, 2017 1:34 p.m.
kind of starting in Houdini, sorry if this sounds like a noob question. 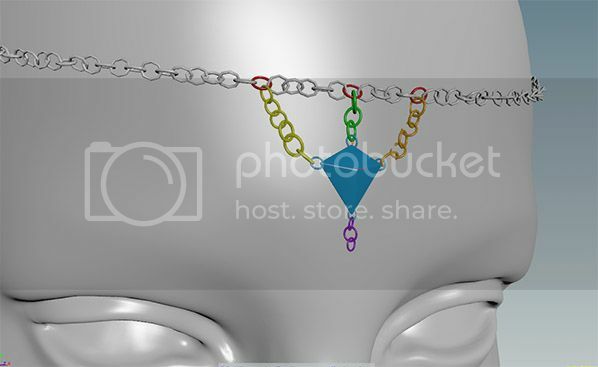 ok, so I have this simple rigid body sim where some chains are connected to a gem stone, the upper part (red circles) are an alembic animation (static/deforming rbd), the animation in this case is not too fast. The rest (other colored parts) are all active rbds. After trying many settings I decided to changed to Houdini rbd solver which is of course a bit slower (I believe it does not support packed geometry,right? ), but is far better and more stable.. still, haven't found a 100% reliable situation, because the chains also break at some point. For the static rbds I'm using “deform geometry” and “re-evaluate SOPs to interpolate geometry”. Scene scale is set to cm, and the object sizes are pretty much real world. 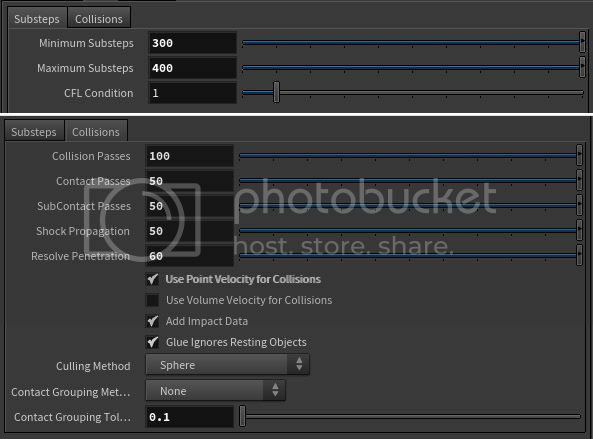 All collision volumes are checked and are small enough to retain details, so I believe I'm having trouble setting optimal engine parameters. These settings below are kind of working, but too overkill. It needs to run overnight, but I'm sure I would not need this much steps to a relatively simple simulation, right ? So my real question is, how do you tweak substeps and collision passes when simulating chains? June 2, 2017 4:10 p.m.
Chains are considered as convex hull by default. You should convert each chain to set of spheres with VDB to Spheres. HIP file is attached for more info. June 8, 2017 1:24 a.m.
Hey thanks a ton for the hip Nima! and sorry for the delay..
this is great, and works nice and robust enough so that my pieces don't break. Now my only problem is with deforming bodies.. My chains are not procedural, but instead were modeled and animated by hand. So what I have to work is an alembic with deforming meshes. I know deforming geometry is not optimal for rbd simulations as I believe it is internally seen as if the objects teleport from one frame to another.. what is the proper way to handle collisions effectively in this case? June 8, 2017 1:28 a.m.
…just a side note, the one big reason why my previous settings (bullet solver with “concave” rbds) were not working was mainly due to my objetcts not having normals calculated. This plays a big role in handling penetrations, and once I add normals to my geometry everything was solid and I got a stable result with 20 substeps and 180 constraint iterations (“use parallel constraint solver”=checked).